At this moment, a Canadian national election is playing out with various parties vying to convince the North American country's people that their beliefs best represent Canada. Attempting to ignite the notions for what Canadian values are most important, candidates challenge the for the heart and soul of Canada for a nationwide vote. Well over 800 kilometers away from the Windsor/Detroit border crossing, an patriotic surge of Canadian spirit will ride around a 1.25 mile oval this weekend as part of the NASCAR Nationwide Series race in Nashville. Announced this Tuesday, a co-owner of multi-billion dollar financial firm Investment Planning Counsel has pursued a new, personal venture. Entering the very competitive NASCAR stock car racing circuit, Canadian business Steve Meehan unveiled his Go Canada Racing team. Selected to drive Meehan's Canadian stock car racing is stand-out JR Fitzpatrick. A champion of the 2006 CASCAR Super Series (now reorganized as the NASCAR Canadian Tire Series), the youthful talent of Fitzpatrick has not been a phenomenon limited only to the top side of the 49th parallel. Driving a NASCAR Camping World Series Truck for TRG Motorsports at the Daytona 250-mile race in 2009, JR Fitzpatrick not only survived the high-speed competition but firmly challenged the more veteran stock car drivers. Fitzpatrick finished 4th in that race which kicked off some initial interest later from the Kevin Harvick Incorporated (KHI) race team. Though JR Fitzpatrick and KHI were able to compete several races together in the NASCAR Camping World Truck Series and two Nationwide Series road races, the pairing never reached full potential. KHI decided late in 2009 to divest themselves from driver development and focused solely on placing established drivers to please sponsors. Returning to the NASCAR Canadian Tire Series full-time in 2010, Fitzpatrick regrouped for a title-contending season with two wins. Delivering JR Fitzpatrick his dream position for competing in a major United States NASCAR tour, the Go Canada Racing team have matched the 22-year old driver with experienced crew chief Newt Moore. Enthusiastic about the team, Fitzpatrick responds "Steve has put together an outstanding team and given us the tools to succeed in this sport. We have a great crew, a great car, and a great team, and I'm looking forward to competing with some of NASCAR's best, starting this weekend in Nashville." 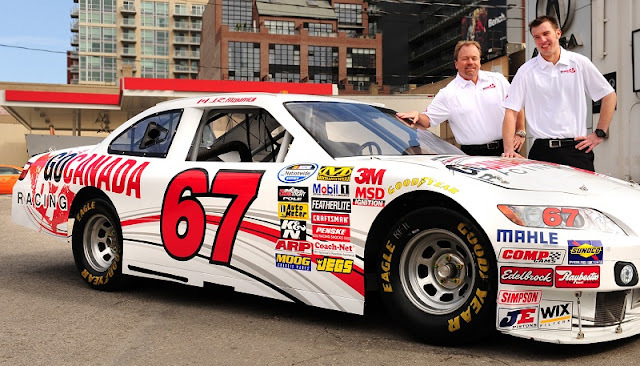 Debuting at the Nashville Superspeedway's NASCAR Nationwide Series race on April 23rd, Go Canada Racing will wear a white #67 Ford Mustang with bright red details. A highly ambitious operation, Go Canada Racing is not the first Canadian owner/driver combination to run in the NASCAR Nationwide Series tour. Oshawa, Ontario's car owner and past driver Randy MacDonald has employed fellow countryman on two occasion. Reigning 2010 NASCAR Canadian Tire Series champion DJ Kennington drove many races for MacDonald Motorsports from 2007 to 2009. Current French-Canadian INDYCAR driver Alex Tagliani also joining the team for the 2009 Nationwide Series race in Montreal. Based heavily on Canadian symbols and people, even the car number of the Meehan-owned team is significantly Canadian. The number '67' represents the year in the 19th century when Canada proceeded to becoming an independent nation. Due to NASCAR's commitment to provide a 43-car field in the Nashville 300, the #67 Go Canada Racing Ford Mustang is assured a starting spot for this first outing. Through two Friday practice sessions for the NASCAR Nationwide Series, JR Fitzpatrick placed 25th and 33rd fastest on the timing charts. Competing against some of the best stock car racing drivers and teams, Go Canada Racing understands success will be hard-earned. Comparing the race teams in the United States to the organizations in Canada, Fitzpatrick says "I think the competitiveness in the United States is the major difference. In Canada you go out each week and there are 5-10 guys that are going to be your main competition. In the states you have 25 guys that you are racing each week." Showing endurance through harsh winters and ruggedness interacting with a vast country like fellow country mates, it is impossible to believe that Fitzpatrick or anyone in the entire freshman Canadian racing team will bow to this challenge. As team owner Steve Meehan iterates, 7 million avid NASCAR fans in the true north strong and free will support the #67 Ford Mustang.